Robert and Ella Mae Hudson purchased their 35 acre Polk County farm after a 20+ year Air Force career. They planted a 15 acre vineyard in 1979. Their winery was bonded in 1981. Ellendale Vineyards was named after the town of Ellendale, located 12 miles west of Salem. The winery offered 27 different varietal and berry wines. 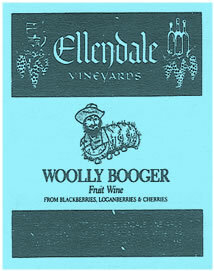 Their most popular berry wine was called “Woolly Booger”. Don’t laugh. This was their bestselling wine! Robert handled the winemaking chores while Ella Mae hosted the tasting room. An added attraction when visiting the tasting room was viewing the various landscape paintings by Robert. He not only was a winemaker but an artist too. The Hudson’s continued to make and sell wine into the early 1990’s. It’s not known when they finally decided to retire a second time! The winery and tasting room were located at 300 Reuben Boise Road, Dallas, OR. The tasting room was open “whenever the gates are open”. How’s that for being friendly! !